spring dosa recipe | schezwan dosa recipe | chinese dosa recipe with detailed photo and video recipe. a fusion to south indian dosa recipes to indo chinese cuisine prepared very similar to the popular veg spring roll recipe. this recipe has evolved as popular street fast food of india especially in mumbai streets. 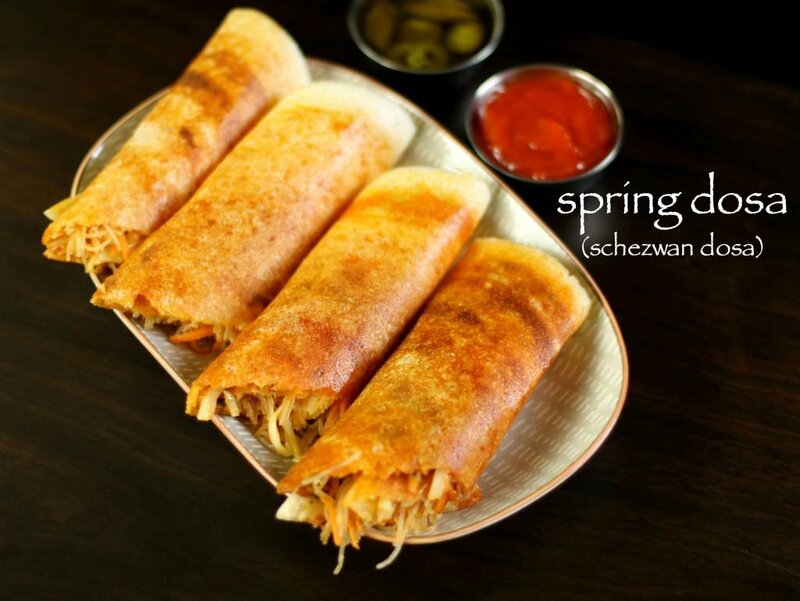 spring dosa recipe | schezwan dosa recipe | chinese dosa recipe with step by step photo and video recipe. basically a fusion of 2 cuisine recipes and is prepared and stuffed similar to veg spring roll. in other words, prepared similar to masala dosa, but filled with stir fried veggies and noodles instead of aloo bhaji or potato masala. moreover, schezwan chutney is applied on top of noodle dosa which technically replaces the red chutney. well to be honest, i am not a huge fan of schezwan dosa or this fusion dosa recipe. i always prefer my favourite simple masala dosa or mysore masala dosa recipe. however my husband is crazy about this spring dosa recipe and always request me to prepare with left over dosa batter. perhaps he may have developed the taste for mumbai special schezwan dosa because of his frequent visit to mumbai during his early career days. typically you can use any dosa batter, but i have used home made masala dosa batter prepared in mixer grinder. 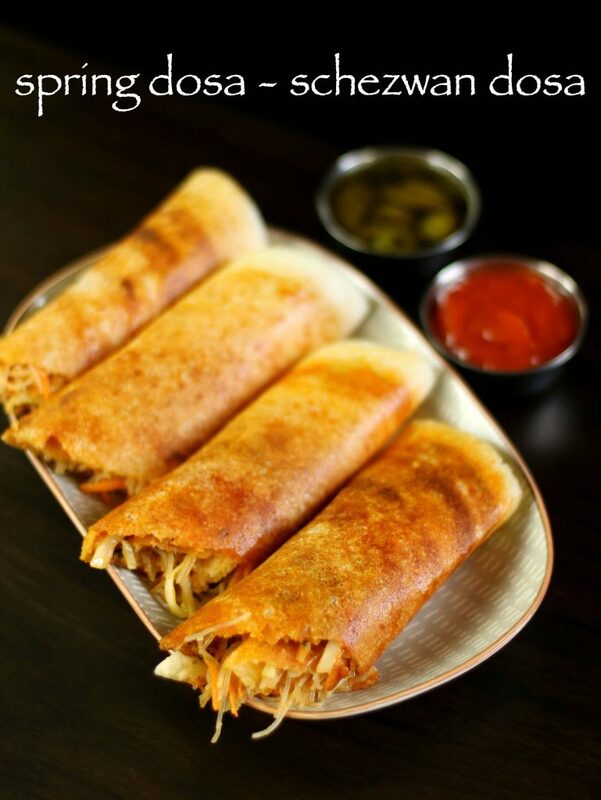 furthermore, some important tips and variations for this amazing fusion chinese dosa recipe. 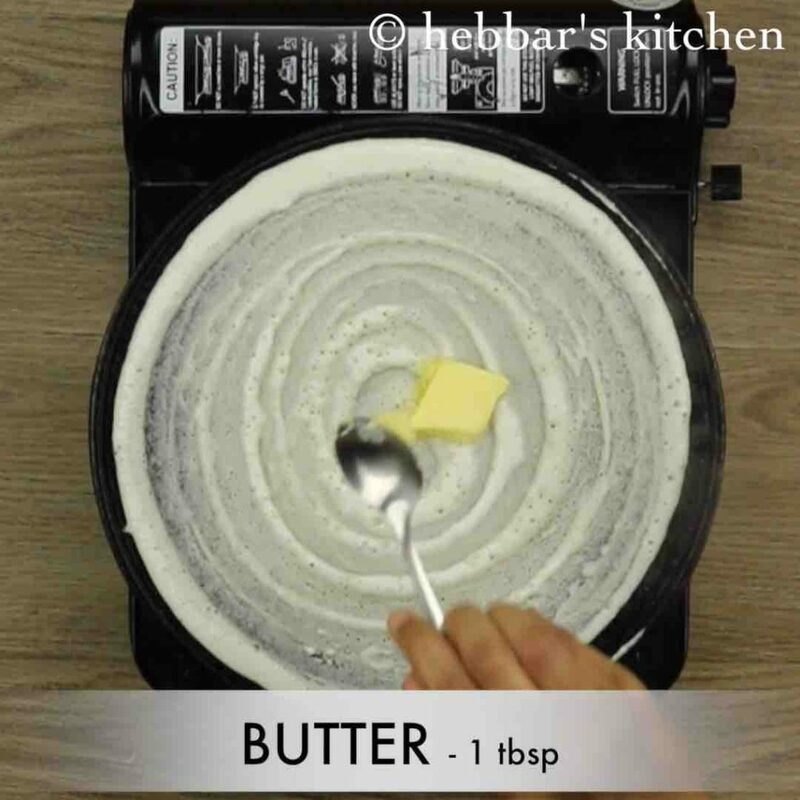 firstly, the dosa batter has to be spread very thin very similar to masala dosa. 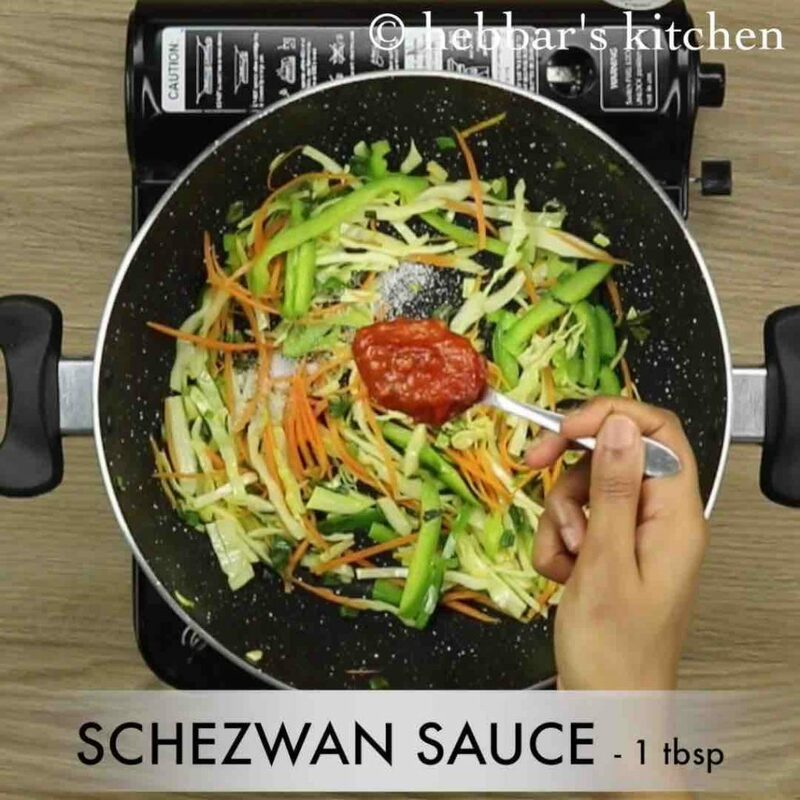 this basically helps to spread the schezwan sauce easily and also to roll them and cut into spring rolls. 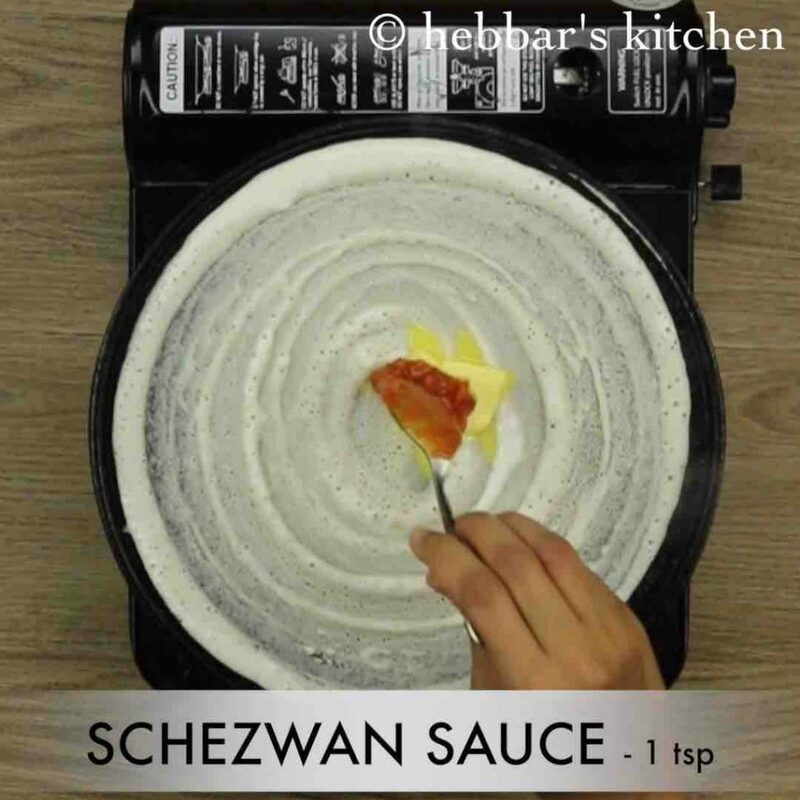 secondly, i have used home made schezwan sauce recipe, alternatively you can also use chilli sauce as spread on top of dosa. lastly, you can serve these spring dosa with either south indian chutneys like coconut chutney or tomato chutney, but can also be served with chilli sauce or soy sauce. 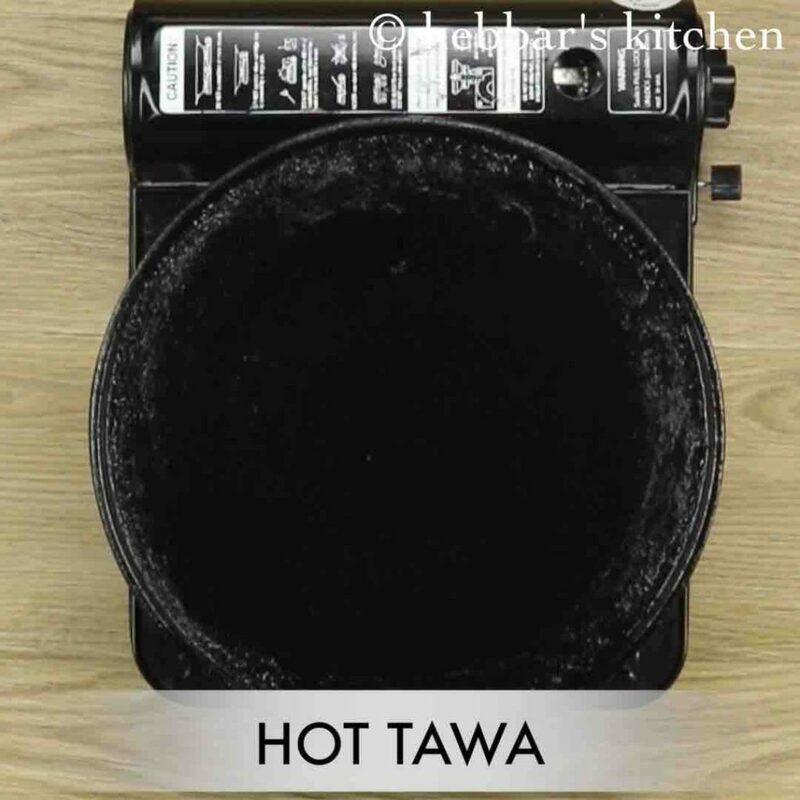 firstly, in a large kadai or wok heat oil. further add garlic and saute well. 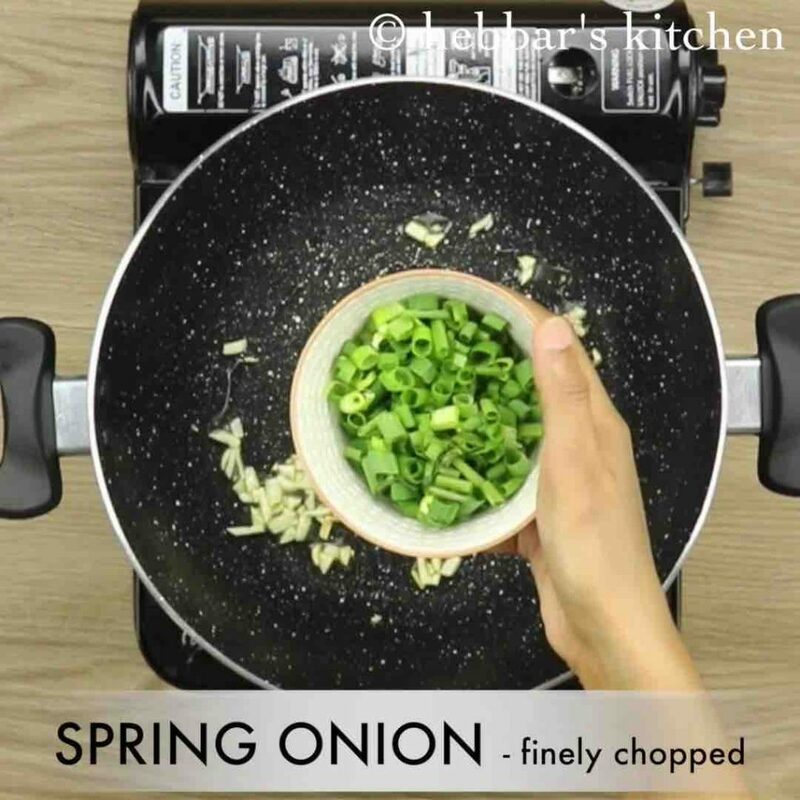 also add spring onions and continue to sauce. now add vegetables and saute for a minute or till they shrink slightly. additionally add salt, schezwan sauce, soy sauce and vinegar. also add cooked rice noodles or any noodles of your choice. 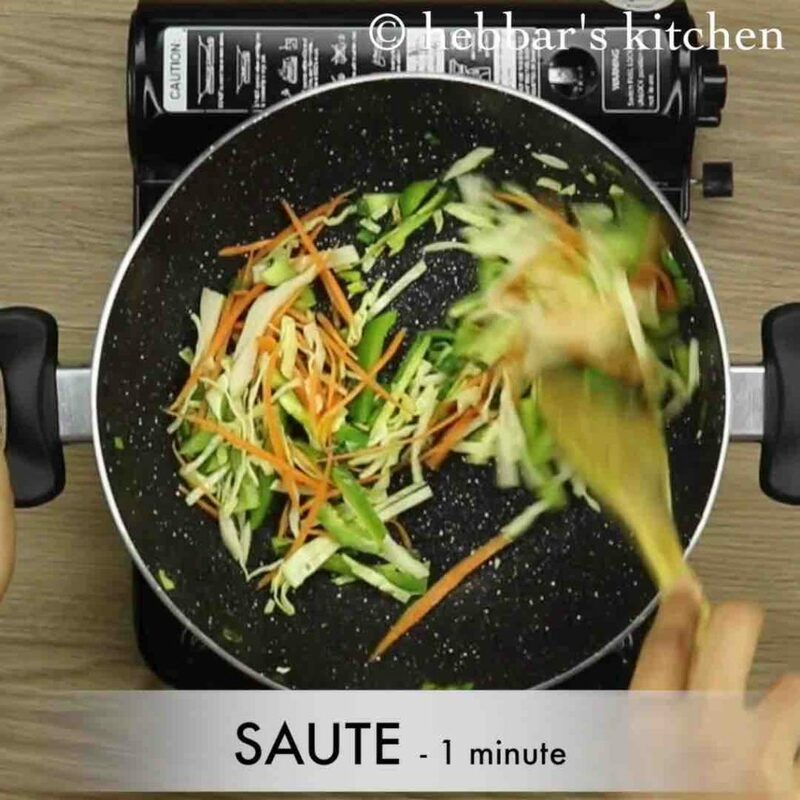 mix gently without breaking the rice noodles and making sure the sauce has covered uniformly. keep aside. 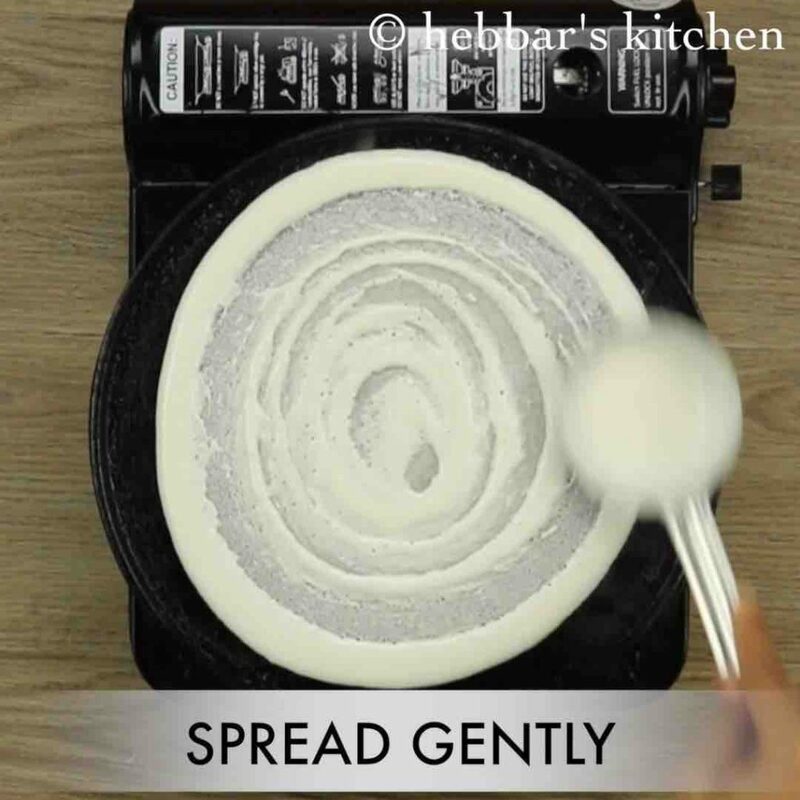 pour a ladleful of the dosa batter on it and spread it in a circular motion thin circle. and mix schezwan sauce and butter together and spread. 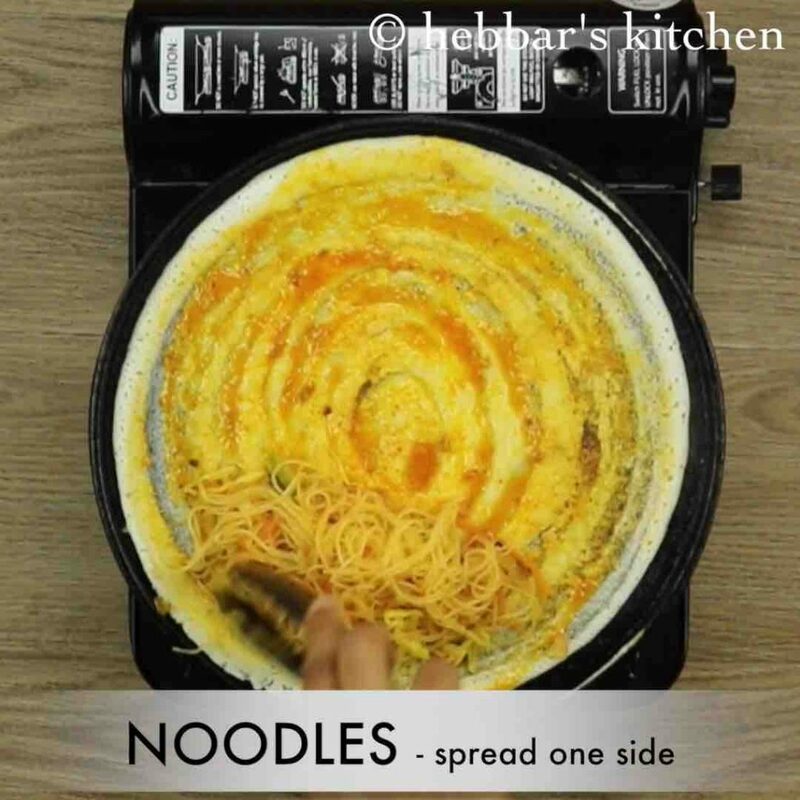 also spread 2 tbsp of prepared schezwan noodles at one side. cook till the bottom of dosa turns golden brown. then roll the dosa along with noodles. 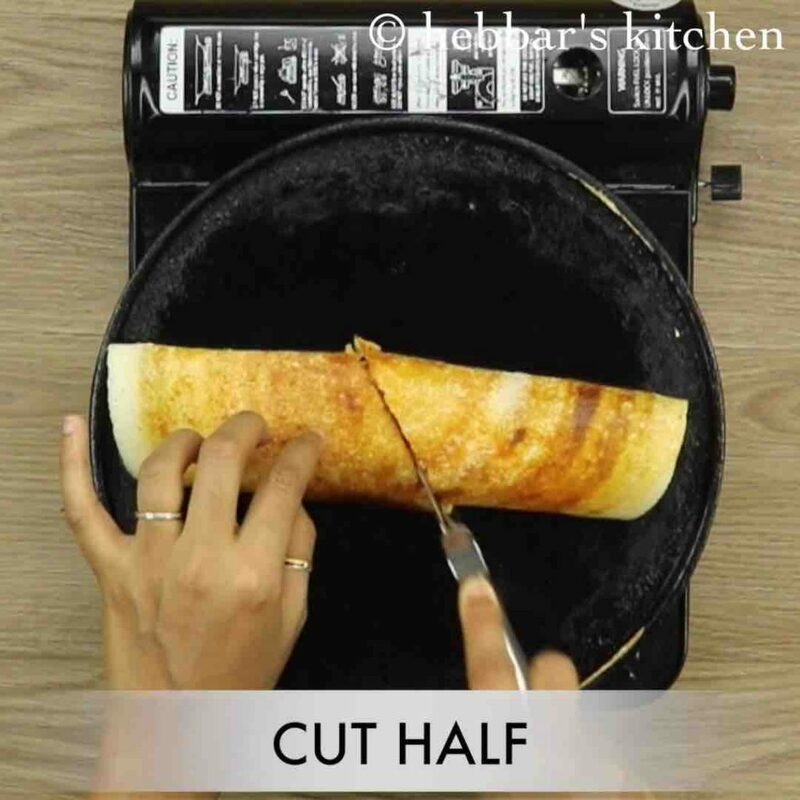 finally, cut half schezwan noodle dosa or spring dosa and serve immediately with tomato sauce. 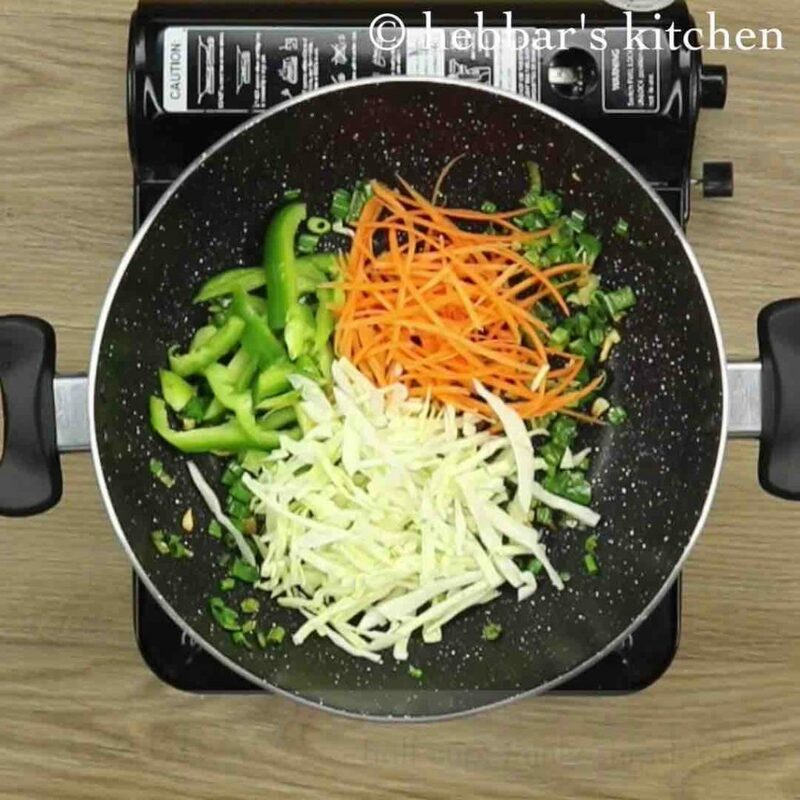 now add vegetables of your choice like capsicum, carrot and cabbage. saute for a minute or till they shrink slightly. also add cooked rice noodles or any noodles of your choice. 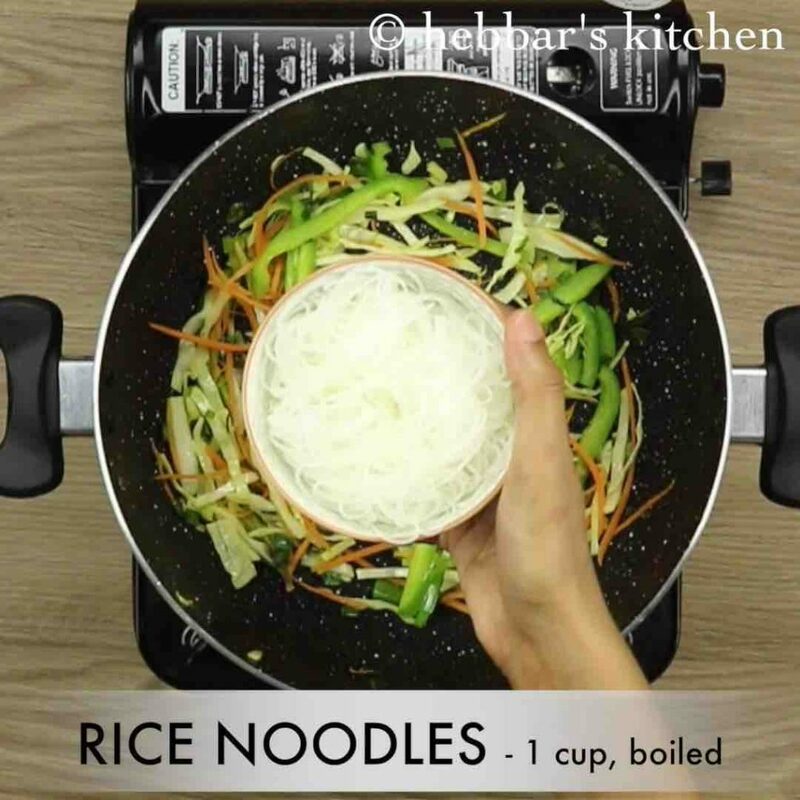 to cook rice noodles refer the package instructions as each noodles has to be cooked differently. however, i have soaked the rice noodles in boiling water for 10 minutes and later drained. 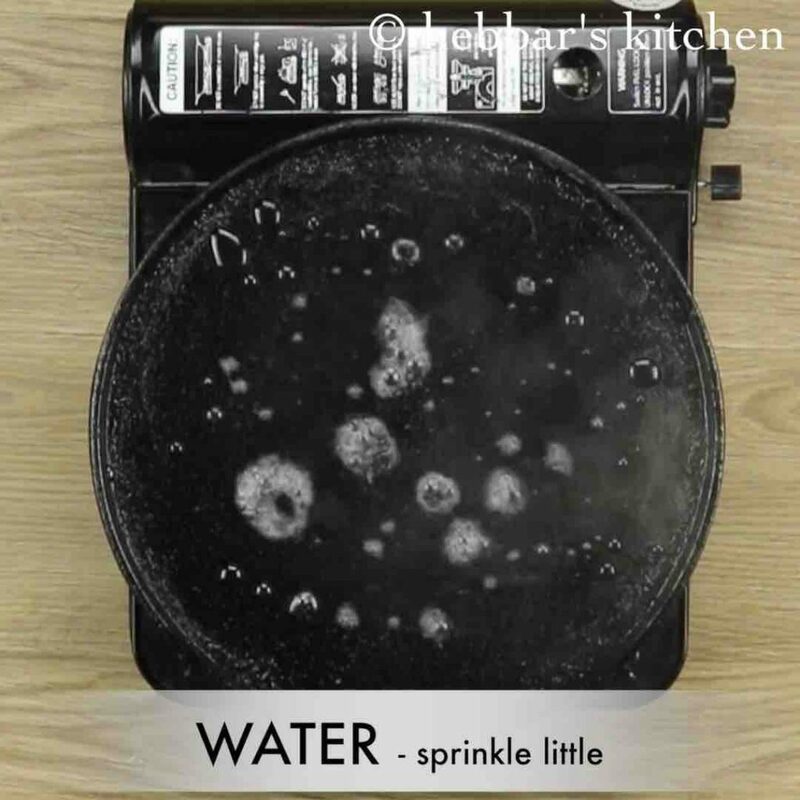 furthermore, sprinkle some water and wipe off with wet cloth or tissue. 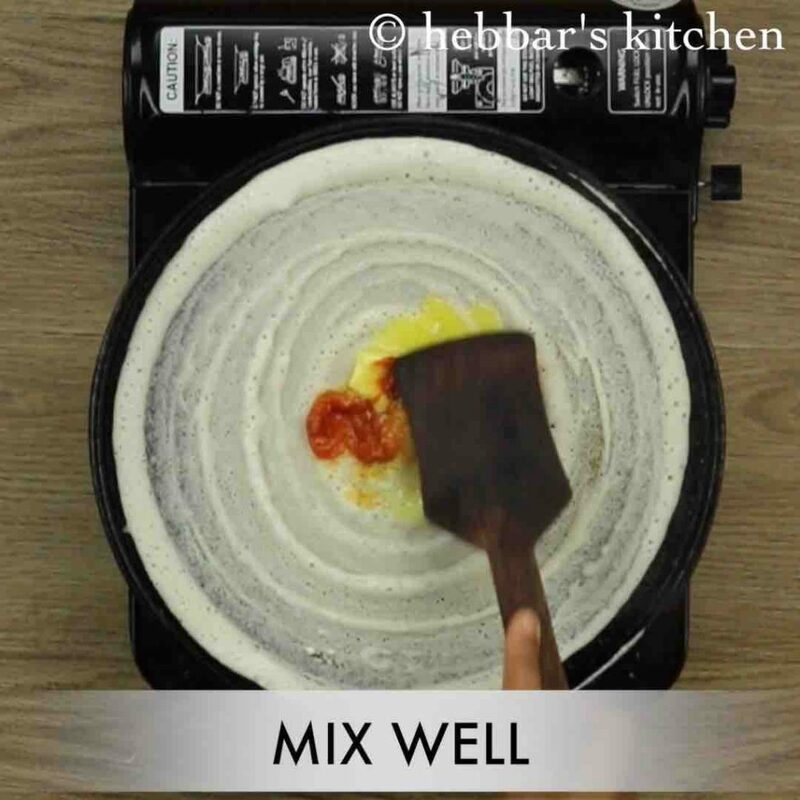 and pour a ladleful of the dosa batter on it and spread it in a circular motion thin circle. once the dosa dries out from top, add a dollop of butter. 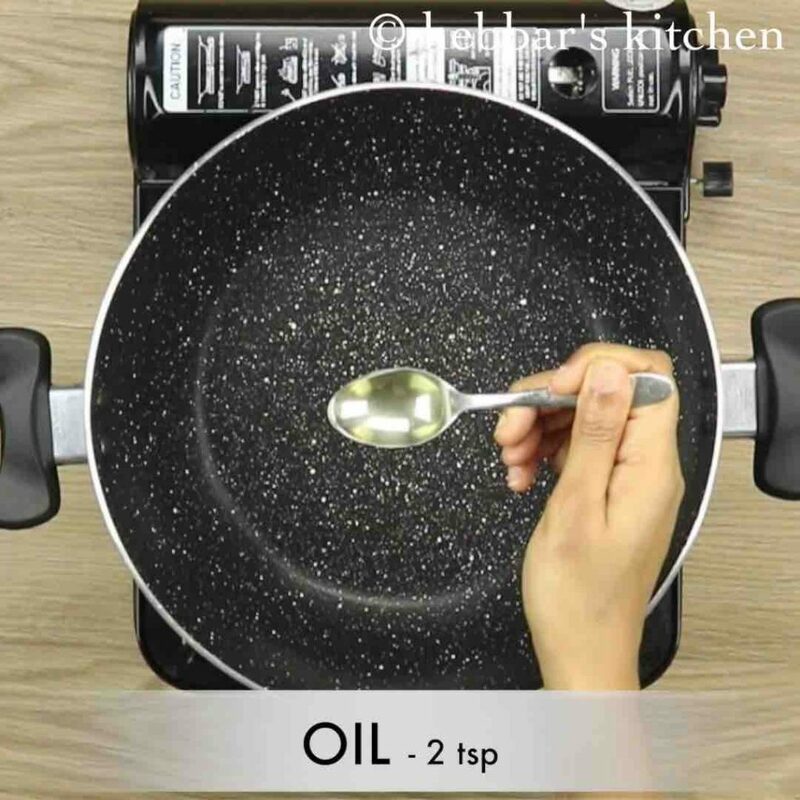 also add schezwan sauce, adjust the sauce according to the spice level you are looking for. and mix schezwan sauce and butter together. 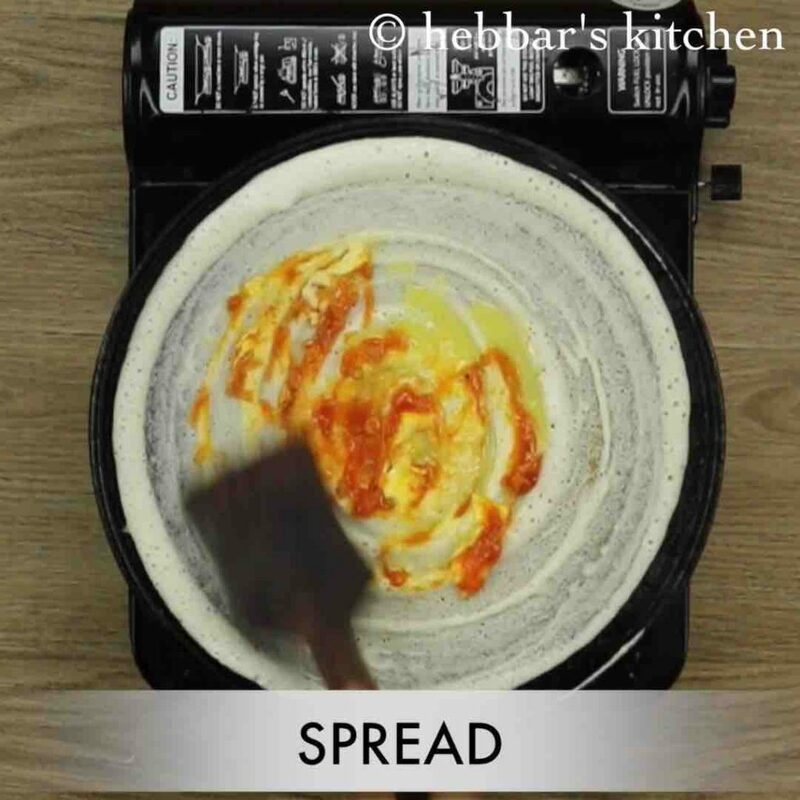 furthermore, mix and spread all over the dosa. then roll the dosa along with noodles and cut half. 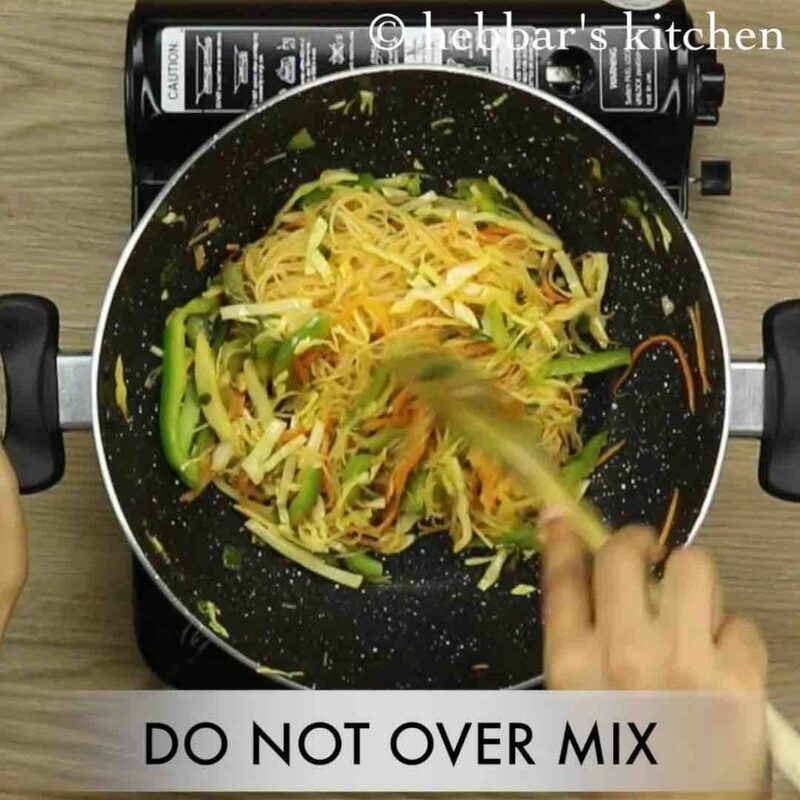 firstly, use any noodles of your choice, however, rice noodles taste great for spring dosa recipe. 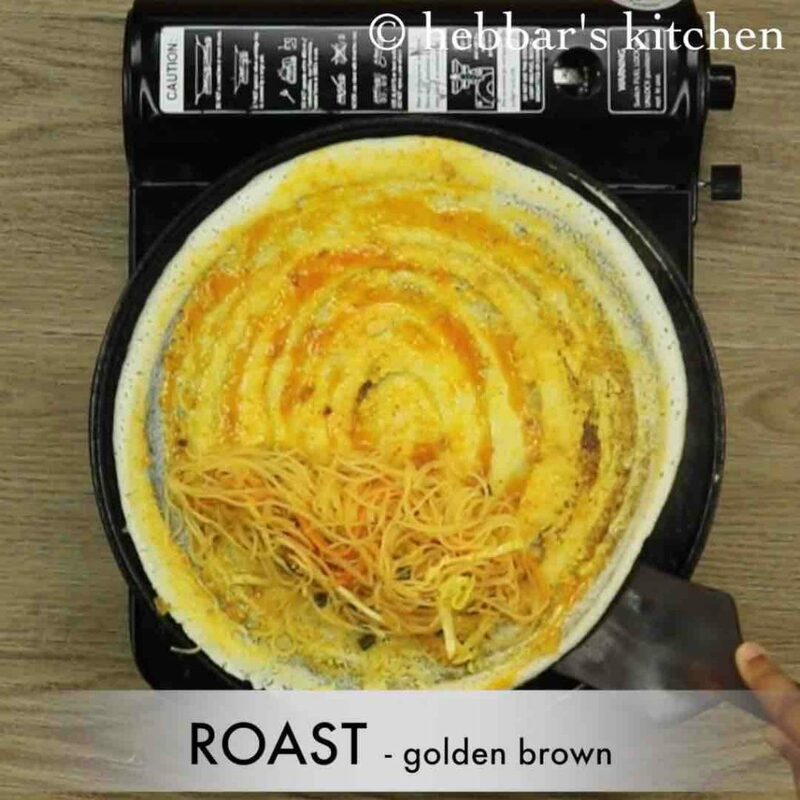 additionally, add generous amount of butter while preparing dosa to get rich golden colour and crispy texture to dosa. also add vegetables of your choice to make schezwan noodle dosa more healthy. 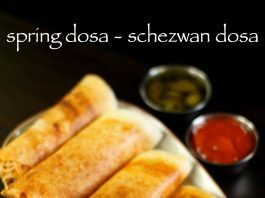 finally, schezwan noodle dosa or spring dosa taste great when prepared it spicy and served hot. Hi, I want my kids to try this. Can you let me know if I can use a different sauce instead of schezwan sauce which is similar but no spicy at all. you can use tomato sauce or prepare red chutney.. Thanks for the reply. Sure to mention your recipes are so good. you are welcome shefali. I am glad you liked it. Hi.. 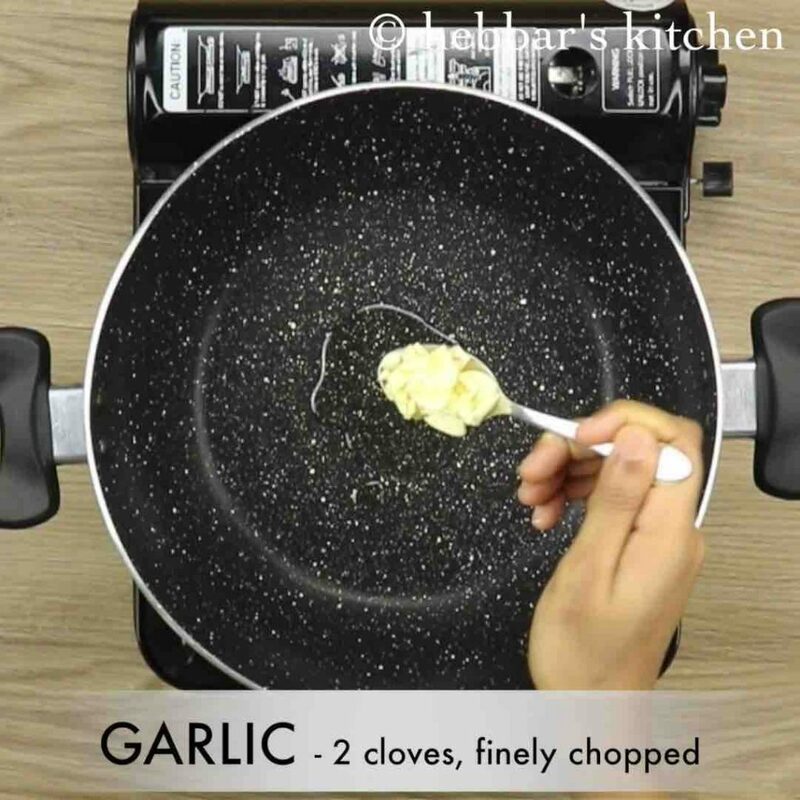 I tried this yesterday and it turned out to be a hit.. Everyone loved it… Thanks a lot… I like your videos very much… They are nice, short and to-the-point.. I hope you keep posting lot of new recipes…Thanks again! you are welcome Purva and thanks alot for trying our recipe. Vidhya here, and i Tried this today, totally awesome thanks s lot for this great invention. Hi.. I love all your recipes n videos? It’s all so beautiful.. Which tool do you use for video editing? Can you please let me know?